We use a framework known as the Core Development Model. Within this model a core team of staff is allocated to work closely with the young person to promote a shared responsibility for their care. This includes a link worker whose responsibilities involve liaison with the young person, families, referrer and care co-ordinator. The Highfield Unit Oxford team offers individualised care for each young person. Following assessment the team will make a care plan using a range of treatments and interventions. Effective care planning enables clinical work to be targeted on specific areas of need, ensuring that interventions are consistent and organised. Throughout an inpatient stay a CPA care plan is in place. Day patients receive the same treatment options as all other young people. Day patient care is for inpatients who are moving towards discharge, or those for whom inpatient stay is not appropriate. 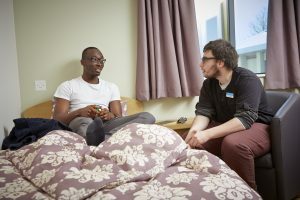 Young people who come from out of area are eligible for the day patient programme, however, this depends on the distance and their ability to travel.